Magenta Salad - A recipe from Savor California, the online showcase for extraordinary gourmet foods and beverages from California. Cook noodles according to package directions al dente. Drain and cool with cold water. 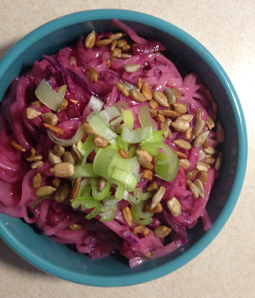 Toss cabbage, beets and scallions with the cool noodles. Smother generously with Ginger Miso Dressing. * Note: Cooked rice noodles do not keep well.